The replicas made in our workshop are always based on iconographical depictions from given historical period (usually a statue or an effigy) or extant examples that survived the ages. Thanks to very precise manufacturing process our belts are light, which makes them comfortable to wear. 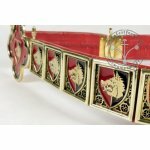 The belt is composed of 20 brass mounts (16 regular plus 4 on the adjusting piece), rectangular with a heraldic shield in the middle. 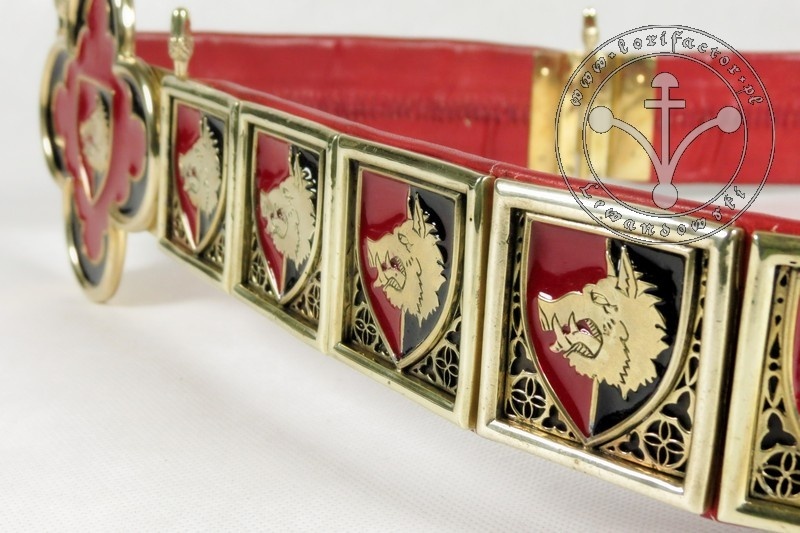 On the belt seen here the heraldic figure is a wild boar’s head on a bisected enameled background. The back of the mount includes openwork on blackened background. 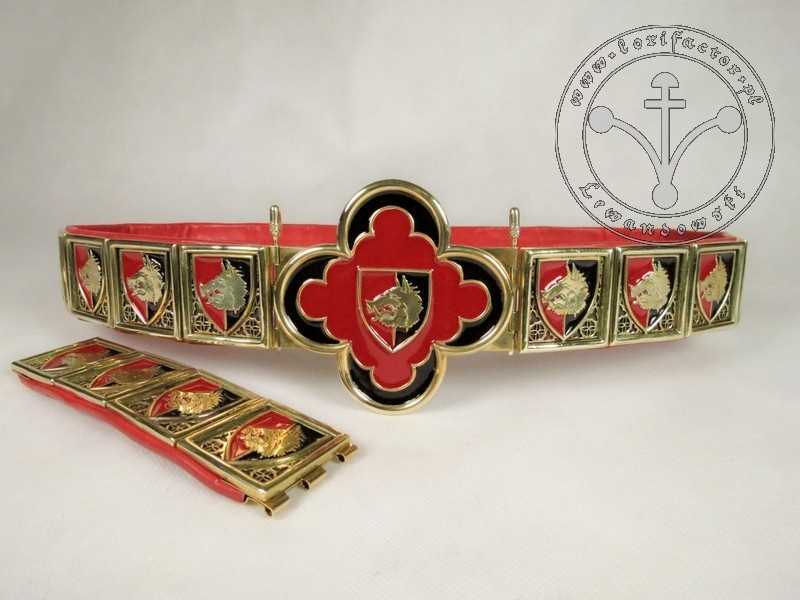 The buckle is a large, four-leaf rosette also decorated with the heraldic shield. 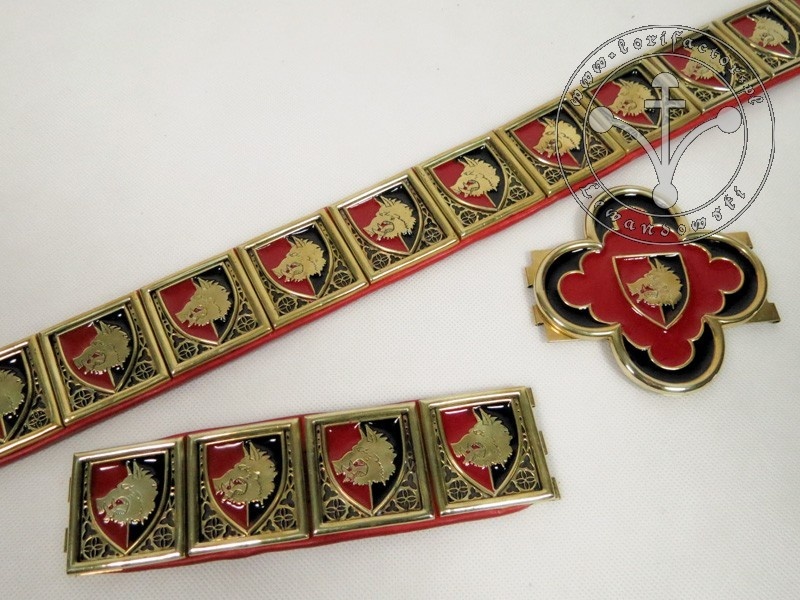 The mounts are fixed to a thick leather belt, hand-sewn together with another one, much thinner. The seam runs on the inside, as you can see in the photos. 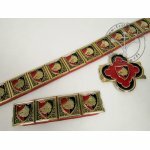 The length of the belt can be adjusted with 4 additional segments and removable, decorative rosette. All removable elements are assembled with decorative pins. 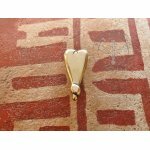 Materials: brass, natural leather, enamel. Price: Please send us a query from the product’s page or directly via e-mail. Remember to include your waist circumference both smaller (as in civilian garments) and larger (as in your armour).